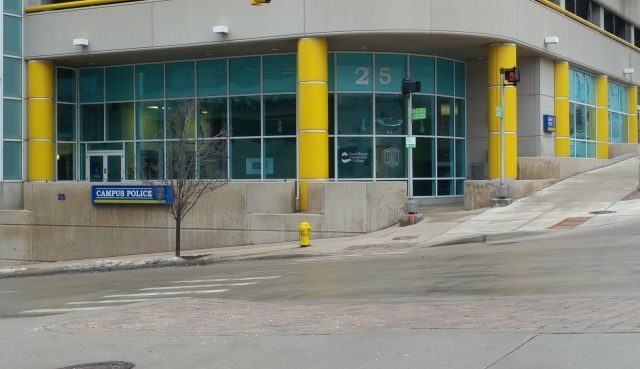 On March 15, at approximately 5:38 p.m., a Grand Rapids Community College Police officer was informed by GRCC Facilities staff that a green Subaru was parked under the bottom portion of Sneden Parking Ramp for over a month. The facilities staff told the officer that the vehicle was parked in the north row of the student parking lot under the ramp. The officer ran a check on the Subaru’s registration and found that it belong to a woman who was neither a GRCC student nor staff member. The officer also looked up the vehicle’s address and no one presently lived at the address. There was a 48-hour parking notice issued at 5:40 p.m. and the Subaru was available to be impounded on March 17 at 5:40 p.m. The case remains open. On March 15, between the times of 5:26 and 5:41 p.m., two GRCC police officers responded to a complaint about an individual sleeping in the stairwell of Bostwick Parking Ramp, level six. When the officers arrived to the scene they met a man and woke him up to talk to him. He said that this was the first time that he had slept there and that he was cold and tired of being harassed at Mel Trotter. The officers ran a background check on the man, and it came back that he had no previous contact. He was told by the officer of the boundaries of GRCC, and was given a verbal warning for trespassing. Afterwards, the officers escorted him off campus. On March 19, at 12:03 p.m. an officer was dispatched to Lyon Street Parking Ramp about a property damage accident. When the officer arrived to the scene he was met by a male GRCC student who told the officer that he struck two unoccupied vehicles (black Subaru and a silver Mercury) near the southeast corner of the ramp. The Mercury had several scratches on the rear bumper cover and the Subaru had scratches to the corner of the rear passenger side. The student said that while he was backing his blue Chevrolet out of the parking spot, he struck the two vehicles. He said that his brakes failed and said that he would have his truck towed. The officer advised him about obtaining a copy of the report for insurance purposes. The officer left their contact information on the vehicles and later made contact with the owners and informed them of what happened. One was provided with a Freedom of Information Act form (FOIA) and the other gave her insurance information and was provided a FOIA form as well to receive the report for insurance claims.